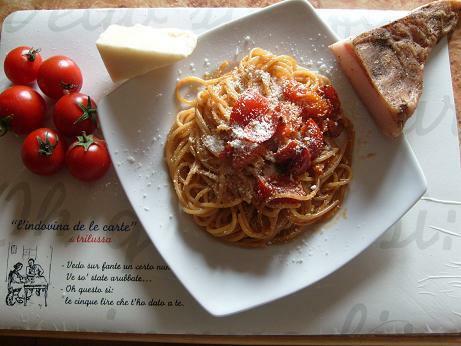 Start today with a plate really known throughout Italy and beyond. A simple dish, but few can do. 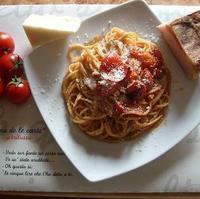 "Bucatini all 'Amatriciana", must be very well the classic spaghetti. This fantastic first course, has an ancient history. Everything comes from the creativity of pastors Rieti, near the "Village of Amatrice." In practice, the border between Lazio and Abruzzo. This recipe, given the Lazio was born in Abruzzo in reality, because until 1927," Amatrice ", was the province of the 'Aquila". Probably this recipe was prepared with only .... no tomato products available, the "crackling" in place of the exceptional type bacon. The cheek of cured pork and seasoned with plenty of hot pepper (guanciale), and the inevitable Pecorino cheese, in those areas. But now we try to make this recipe, follow step by step and the result will not disappoint. First, with a knife, we cut our bacon diced, not too small. Take a large skillet, preferably when it is red-hot iron and let our bacon. Mix well and pour the white wine. Let it evaporate, but do not dry out the bacon. Cut the tomatoes into 4 pieces and put it in a pan. We cook it for a few minutes if you like, we can add more chili .... no exaggeration. Boil the pasta and remove the water one minute before the classical cooking al dente. Do not take away all the water, we will need very little water to mix the best, our pasta. A fire is out, we put the cheese powder. Mix well. As you noticed, I did not add salt to the sauce, that the presence of the same cheese and bacon, as a rule, very salty. The salt we use only water from the pasta, but even here, paying attention. In the meantime, we have made, warm, 4 plates. We serve this delicacy smoking, with a bit of pecorino cheese for garnish. Accompany with a good red wine "Velletri Rosso". For any further questions, I'm here for you ..... thanks and see you soon. The cheese "Pecorino" is made from sheep's milk. A cheese is very seasoned, but very tasty. I think, you can find the best stocked in supermarkets in your town. Sorry for my English, really bad.